The Girlfriend Body Pillow helps you not sleep alone. 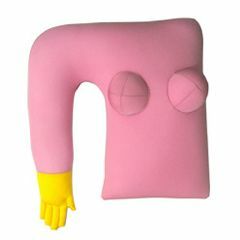 The pillow produces a soft and comfortable arm or maybe you are enjoy a better sleep when you locate your neck in your girlfriend or wife's breast. This hug pillow has an extension that replicates the soft arm of your partner and also adds a breast-like sensation on the pillow, giving all the contour of your love one. Your days of uncomfortable nights are over. Whether your wife is away working or you broke up with your girlfriend, this hug pillow will maintain the comfort of your sleep. The Girlfriend Pillow imitates the contour of your loved one at your side while you sleep.